This method should be applied when you have no iTunes or iCloud backup available. You can choose a professional iPhone SMS recovery software to retrieve deleted text messages from iPhone or iPad. In consideration of stability and completeness, Gihosoft iPhone Data Recovery is a perfect choice. This software is powerful on recovering iPhone data and works well with the newest iPhone X, 8/8 Plus, 7/7 Plus, SE, 6S/6S Plus, 6/6 Plus, etc. Please install this program to your computer and launch it, then follow steps below to retrieve deleted messages from iPhone. Step 1. Select “Messages” that you need to recover. Step 2. Connect your iPhone to computer via USB cord. Step 3. Scan for deleted text messages on your iPhone. Step 4. Preview and recover deleted messages on iPhone. This method requires iCloud backup for your iPhone. You can restore iPhone from iCloud directly, but it merely restores the messages that have been backed up yet will wipe the existing messages and other data. 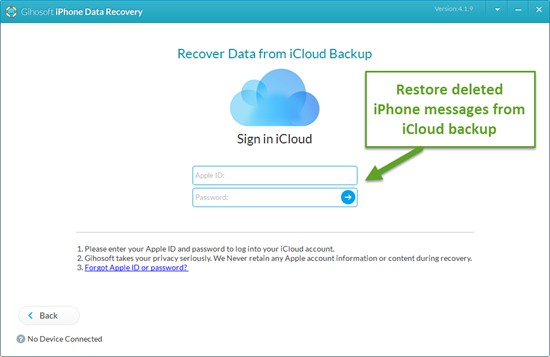 Therefore to avoid the risk of losing any data, Gihosoft iPhone Recovery software also provides you a safer and easier way to retrieve deleted text messages from iCloud backup. 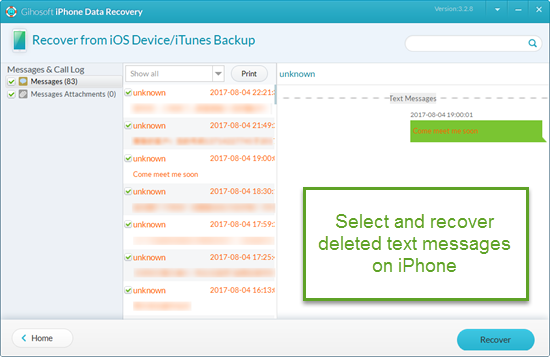 Run iPhone SMS Recovery on computer and select “Messages”. Click on “View iCloud Backup” and sign in with Apple ID. Check the date of backups and select the latest one to scan. After scanning, preview and recover deleted texts on iPhone. This method requires iTunes backup for your iPhone. You can restore iPhone from iTunes directly, but it also restores the messages that have been backed up and will wipe the existing messages along with other data off your iPhone. If you want to check the backup first and extract messages from iTunes backup only, Gihosoft iPhone Recovery is also able to recover messages from iTunes. Please follow steps below. Open iPhone SMS Recovery and select “Messages”. Click “View iTunes Backup” and select a backup for scanning. 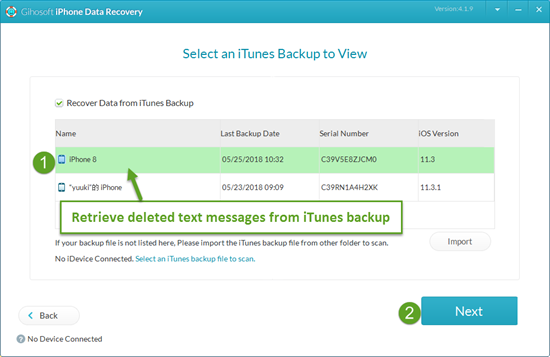 Preview and restore text messages from iTunes backup. Besides SMS, iOS users can send iMessages free of charge while connected to WiFi or other cellular network. 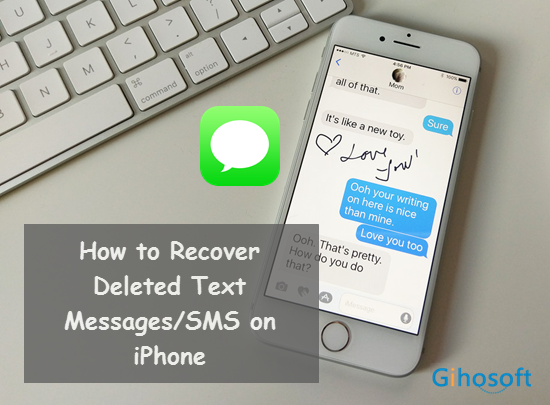 If you accidently deleted or lost iMessages, Gihosoft iPhone Recovery software is also able to recover deleted iMessages for you.